Located in downtown San Anselmo, Creekside Pizza & Taproom is a community hub and welcome blend of local hospitality, award winning craft pizzas, Marin’s best selection of craft beers on tap, outstanding wines, and their incredible staff’s commitment to serve the community 365 days a year. A partner in our Community Meals program, Creekside prepares extra pizzas especially for ExtraFood to pick up and deliver to the Marin City Senior Center every month for their senior luncheons. Yum! We are truly proud to partner with Creekside to bring delicious food to support our local seniors in need. The first 100% organic creamery in the U.S. and a Northern California icon, Straus Family Creamery humbly began as a dairy farm on the shores of Tomales Bay. The beloved artisan creamery currently offers cream-top milk, yogurt, butter, ice cream, sour cream and a variety of wholesale and specialty dairy products distributed throughout Northern California. This week, we were the lucky recipients of a 100+ pound donation of their delicious yogurt. An important source of protein – one of the top requests we receive from our recipient partners – the yogurt was quickly dispersed among grateful organizations throughout Marin, including several in West Marin, not far from the creamery itself. This San Anselmo artisan cafe and bakery is a community hot spot favored by locals and visitors alike. From post-bike and -run weekend warriors to those who simply want to hangout, relax, and enjoy a delicious bite on any given day, customers find amazing food that is accessible, real and unpretentious. Committed to helping nourish the community through food, M.H. Bread and Butter sources ingredients locally, providing delicious baked, breakfast and lunch items. Our recipient partners look forward to their generous daily donations of tasty breads, muffins and croissants. Opened in 2015 and located in downtown Larkspur’s historic Lark Creek Inn space, Perry’s on Magnolia carries forth the 50-year-old Perry’s San Francisco tradition of serving classic American food and warm personable service. Nestled amongst the redwood trees and on the bank of the Arroyo Holo Creek, Perry’s on Magnolia features a variety of outdoor dining options, on their Patio and in the Grove, in addition to a large bar, and casual, lively dining atmosphere. A partner in our Community Meals program, Perry’s prepares extra meals especially for ExtraFood to pick up and deliver to the Marin City Senior Center every month for their senior luncheons. They were also tremendous during last year’s Napa/Sonoma wildfire evacuations, generously making free meals for fire evacuees sheltering in Marin. We are so grateful for Perry’s generosity and dedication to helping us brighten the days of vulnerable residents in Southern Marin and beyond. In addition to their generous weekly donations of produce, dairy, baked goods, prepared foods, and nonperishable foods, this holiday season Trader Joe’s in San Rafael donated hundreds of pounds of turkeys for us to deliver to the needy throughout Marin. We are so grateful to Trader Joe’s for their generosity and for giving us the opportunity to brighten the holidays for so many vulnerable people this year. Urban Remedy is a plant-based organic food company that embodies the belief that Food is Healing. Their ready-to-eat, certified organic salads, bowls, wraps, snacks, desserts, juices, nut milks, and shakes are available at locations throughout Northern and Southern California. The happy staff at the Mill Valley location calls in delicious food donations whenever they have extras to give. We received an especially generous donation from them on Christmas Eve, a wonderful holiday gift for our friends at Voyager Carmel Center and Center Point. It’s such a joy to work with Amy and the friendly and conscientious team at Urban Remedy who make donation pickups so easy. Founded in 2007 by Executive Chef Chad Carlstedt, Classic Culinaire delivers world-class culinary experiences – at weddings, corporate events, birthdays, anniversaries and other special occasions – in Marin, Napa, Sonoma and San Francisco. Their caterers focus on providing two things: delicious food and exceptional service. Believing strongly in supporting local farms and food purveyors, they use only the freshest ingredients, locally sourced whenever possible. They are also committed to giving back to their community through charitable endeavors such as donating their services to the AIDS Lifecycle and donating their extra food to ExtraFood. We (and our recipient partners!) are thrilled to receive their delicious food donations whenever they have extras to give. Nugget Markets has been generously donating highly-coveted, high-quality donations of produce, meat, dairy, baked goods, and prepared foods to us since our early days of operation. If that wasn’t enough, each of their three Marin-based stores – Tiburon, Corte Madera and Novato – recently donated gift cards to us so our highest need recipients could shop for the food they need most this holiday season. Nugget’s generosity truly makes our hearts sing! What’s more, their delightful, helpful staff is such a joy to work with. Thank you, thank you, Nugget Markets for your generosity and continued commitment to making our community a better place for all! Going above and beyond to spread Thanksgiving joy last week, Trader Joe’s generously donated dozens upon dozens of fresh turkeys for us to deliver to food pantries in Marin City and West Marin. We wish you could have heard the joy and excitement emanating from Leticia at the People’s Inter-Cities Fellowship upon receiving 40 fresh turkeys to distribute to the hungry in Marin City. All of our recipients were overjoyed to receive these amazing donations. Thank you, thank you Trader Joe’s for helping us make this an unforgettable Thanksgiving for more than 50 families in Marin County! A family-owned business in San Rafael, Mulberry Street Pizzeria is one of Marin’s favorite destinations for award-winning, homemade pizzas, soups, salads and pasta dishes. The Mulberry Street Pizzeria staff have served delicious, innovative dishes to delight Marin locals and visitors for over 30 years. The newest member of our Community Meals program, Mulberry Street Pizzeria makes some of their favorite pizzas especially for ExtraFood to donate every week. We are thrilled to welcome them to the ExtraFood family! For four years, Terra Linda Safeway has consistently provided generous donations of baked goods, dairy, and frozen foods to ExtraFood five days a week. The store’s Head Receiver, Dede, keeps their large receiving area so organized, making it easy for our volunteers to be efficient in locating our donations. Dede is our go-to person for any questions or requests. We are so grateful to Safeway and Dede for helping us end food waste in Marin! Novato Community Hospital is a not-for-profit community-based hospital dedicated to providing high-quality, compassionate care. A small boutique hospital, NCH has a close-knit team that offers one-on-one, concierge-like care in a quiet, modern setting. Their commitment to caring extends beyond the hospital walls through the thrice-weekly donations of prepared food they provide to ExtraFood. Our friends at EAH Housing’s Mackey Terrace Senior Housing and Homeward Bound’s New Beginnings Center are truly grateful for these wonderful donations. This friendly neighborhood market donates their extra food to us 6 days a week. To date, Marinwood Market has made nearly 800 donations of meat, dairy, deli, and produce items to ExtraFood. Protein and fresh produce are the most requested food items we receive, so these donations are highly valued by our recipient partners. We thank everyone at Marinwood Market for helping us provide some of our community’s most vulnerable citizens with fresh, nutritious food while working to combat food waste. Congratulations to our Food Donor of the Week, the Downtown Novato Community Farmers Market! Managed by Agricultural Community Events, last week we picked up the excess fresh produce from their last market of the season. What a difference the market has made this season! A ton of fresh fruits and vegetables for people in need. Seriously! We’re so grateful to ACE and their market for helping us serve vulnerable children, adults, and families in Novato. 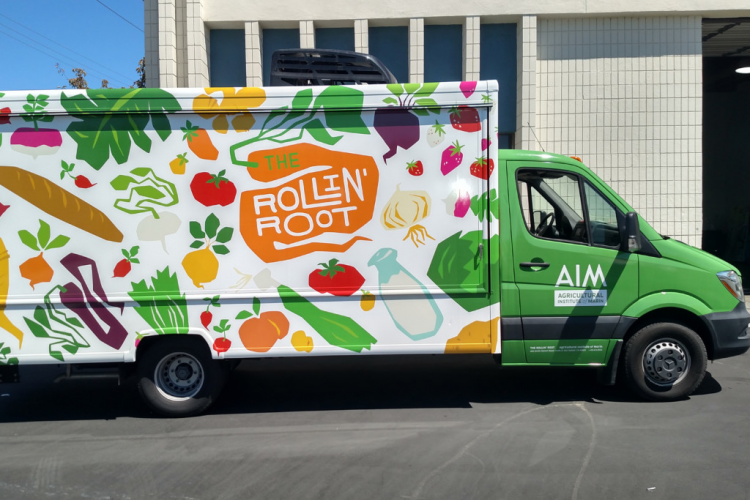 Have you heard of the Agricultural Institute of Marin’s The Rollin’ Root? It’s the coolest thing! It’s a mobile farmers market truck that provides nutrition education and delivers fresh, healthy food grown on local farms to underserved communities in Marin. AIM’s goal is to ensure that all members of our community have access to fresh fruits and vegetables, regardless of transportation or economic barriers. How awesome is that? The Rollin’ Root truck also donates their extras to ExtraFood so that we can get this amazing food to even more people in need. Lucky, lucky us! A full service neighborhood market in San Rafael, Santa Venetia Market proudly offers fresh meat, deli, and produce, as well as a complete line of freshly made prepared foods, salads, burritos, tamales and more. Our recipient partners are always delighted to receive their donations of fresh and healthy dairy, prepared, baked, and non-perishable foods. We‘re so grateful for Santa Venetia Market’s generosity and commitment to helping us end food waste and hunger in Marin. Celebrating 90 years in business, Sacramento-based Nugget Markets is owned and operated by 4th and 5th generations of the Stille family. The Tiburon store is one of three Nugget locations in Marin. Their high-quality donations of produce, meat, dairy, baked goods, and prepared foods are highly coveted by our recipient partners. And their delightful, helpful staff is a joy to work with. To our delight, Nugget Tiburon recently added a 3rd donation to our weekly pickup schedule. Lucky us! In addition to their regular, thrice-weekly grocery donations of fresh and packaged food, Safeway Community Market has provided ExtraFood with 1,000s of pounds of shelf-stable food through its “Bag Summer Hunger” program. Through this program, customers purchase pre-loaded bags of non-perishable foods for $10 each that are donated to ExtraFood. Safeway consistently supports Marin County in making sure that the same quality food we see in the store makes its way to those that need it the most. We are so thankful to Safeway Community Markets for supporting our community. Using local, seasonal ingredients, Marinitas features a lunch and dinner menu inspired by dishes found throughout Mexico and Latin America. Their food combines an exciting blend of new and familiar flavors and their bar is dedicated to classic cocktail preparation and selections from south of the border. Longtime contributors to our Community Meals Program, Marinitas prepares extra meals especially for ExtraFood to pick up and deliver to those in need every week. We’re so proud to partner with Marinitas to bring delicious meals to support the young scholars at Huckleberry Youth Programs and Next Generation Scholars. Located in the heart of downtown Larkspur, Donut Alley serves handcrafted artisan donuts and fresh roasted, organic coffee. Under the leadership of Steve and Ann Pring, Donut Alley made their first bakery donation two years ago, and since then has contributed over 6,500 lbs of food. Our friends at Marin Services for Men, People’s Inter-Cities Fellowship, and St. Vincent de Paul always look forward to their deliveries of high quality treats from Donut Alley. Providing gourmet catering to the Bay Area since the mid-1980s, Mangia Nosh is a full-service catering company complete with a full-service wait staff, event coordinators, and all things needed for a large event. Our friends at New Beginning were delighted this week to receive a surprise donation of over 100 lbs of delicious prepared food and baked goods. We are truly grateful for Mangia Nosh’s generosity and help in working to end hunger in Marin! We’ve been picking up donations of fresh produce, baked goods, dairy products, and prepared food from this fabulous store for more than four years! The residents at Centertown Apartments in San Rafael were so excited when they learned they are the newest recipients of this amazing donation. We are grateful for the bounty of healthy food that comes from Whole Foods Market. Located in Greenbrae’s Bon Air Shopping Center, SusieCakes has been a regular donor since March 2014. They’re an all-American bakery offering classic desserts made entirely from scratch, using simple, natural ingredients. Many of our recipients have enjoyed their delicious treats, especially the seniors at Kurger Pines in Mill Valley. They recently sent a lovely note saying how much these amazing treats add to their weekly Bingo games! Thank you SusieCakes for spreading so much joy in our communities. An offshoot of San Francisco’s well-known Wise Sons Jewish Delicatessen and located in the Marin Country Mart in Larkspur, Wise Sons began calling in donations of their extra bagels to us last fall. They recently increased their donation frequency to five days a week. We are thrilled to include Wise Sons on our growing list of “regular” food donors that provide food donations every week. Our recipient partners are equally excited and are always happy to receive their Wise Sons deliveries. Locally owned and operated, CaterMarin provides creative, delicious Californian cuisine for a variety of events — from weddings and corporate events to lunches individualized for a variety of budgets. CaterMarin has donated more than 700 lbs of bulk prepared food to a number of recipient organizations throughout Marin, including a new ExtraFood recipient partner: Buckelew Programs’ Novato Residential Support Services. We are so very appreciative of their delicious food donations! The original Woodlands Market, the Woodlands Kentfield location has been serving Marin residents since 1985. Still family-owned and run, Woodlands is a key Bay Area destination for a huge variety of exceptional prepared foods, deli and cheeses. We are so grateful for the delicious, generous donations they have provided us over the past year. Last weekend they surprised us with a fabulous donation of over 200 prepared salads. Every last one of them was gratefully received by our community members in need. Extending their care for our community beyond hospital walls, Marin General Hospital has been donating their excess food to ExtraFood 365 days a year since December 2013, our first month of operation. Mike and his team make sure that the food we receive – all of which is made from scratch in the hospital’s kitchen – is of the highest quality. The impact of MGH’s donations has reached far and wide across our county: to seniors, the homeless, kids, vulnerable families in West Marin, and so many more. We are grateful and honored to be working with Marin General to support our community’s health and well-being! Headquartered in San Rafael, Byte Foods combines fresh food and fresh thinking to change the way employers feed their teams. They offer Bay Area businesses around-the-clock food options by stocking their refrigerated kiosks with healthy, hearty, grab-and-go meals. It’s as easy as swiping a credit card and selecting your food option! Seniors, the homeless, youth organizations, Canal residents, and many more have benefited from our regular deliveries of Byte’s delicious food. The second public school district in Marin to join our program, the San Rafael City Schools has been donating their extras to us for over 2 years. Since it’s impossible to forecast with 100% accuracy exactly how many kids will be at school and exactly how much they will eat and drink, schools will often have extra food, and we’re glad to partner with them to get it to those in need. A heartfelt “thank you!” to SRCS for their focus on reducing food waste! Based in Sausalito, Clairesquares creates handcrafted artisan Irish treats and other premium sweets. Clairesquares has donated over 700 lbs of their delicious shortbread cookies to sweeten the lives of those served by many of our recipient partners. We’re delighted that Clairesquares continues to send their extra special treats our way! Flour Craft is a locally owned, artisan, gluten-free bakery serving bread, pastries, and healthy plant-based meals. One of our very first food donors, Flour Craft has been donating delicious treats to ExtraFood from their San Anselmo location every week since our first month of operation in December 2013. Amazing! They also recently opened a new shop in Mill Valley. Their wonderful food donations support the food pantries at the Marin Community Clinics Health Hub in Novato and the San Geronimo Presbyterian Church. NUSD recognizes the connection between healthy students and their ability to learn. As such, nutrition and minimizing food waste at school are important components of their curriculum. Since it’s impossible to forecast daily attendance with100% accuracy, they sometimes have extra food that they generously donate to us. We delight in bringing these yummy meals and snacks to those in need, including children at local YMCA and Head Start after-school programs. Miguel Villareal and his team at NUSD are true leaders in our county’s school system. A private high school dedicated to inspiring excellence in a nurturing, vibrant educational community based on personal and intellectual integrity, The Branson School was ExtraFood’s very first food donor back in December 2013. Since then, they have consistently provided generous prepared food donations that our volunteers bring to grateful recipients at the San Geronimo Community Presbyterian Church every week. The winner of multiple awards, Los Moles serves delicious, filling moles and other Mexican dishes utilizing the distinct flavors of traditional Mexican pueblos and showcasing them with a modern twist. Founder and Chef, Lito Saldaña uses family recipes with no gluten, lard, refined sugar or other artificial ingredients and uses only fresh, local ingredients. We’re delighted to bring Los Moles’ generous weekly donations to Next Generation Scholars and the Mill Street Center. County Line Harvest is a certified organic farm located near the Marin/Sonoma county line. They donate beautiful, fresh produce to our team of volunteers each week at the Sunday Civic Center Farmers Market, as well as whenever they have extras to give. Our recipient partners delight at receiving their bountiful donations and we are truly grateful to them for sharing their harvest with us. Kaiser donates their extra food to us 7 days a week, and the bulk of their donations are complete, microwaveable, mostly organic meals. These meals are highly coveted by a number of our recipient partners whose primary food needs include proteins and complete meals. Kaiser contributes to the health and wellness of our community in so many ways, and we’re grateful that they’re a longtime member of the ExtraFood community. Located in downtown Fairfax, Taste Kitchen & Table is a full-service bakery and café offering breakfast, lunch, meals-to-go, healthy snacks, pop-up dinners, special events and catering. Their terrific food is made from organic, seasonal, fresh-from-the-farm ingredients. Owners Rochelle and Lorenzo donate their delicious savory and sweet pastries and salads to us whenever they have extras. The seniors at nearby Bennett House look forward to their tasty treats! The former Ross Grocery (a.k.a. Eddie’s), Ross Landing is an historic corner deli in downtown Ross. Well known for their breakfast and lunch sandwiches, Ross Landing also offers salads, snacks, drinks, and family-friendly wine tasting events, as well as rents out space for private events. Our recipient partners have been greatly enjoying their delicious donations of prepared items, baked goods, and dairy. One of the stops on our “Central Marin Starbucks” food trip, the Grand Avenue Starbucks has consistently provided delicious donations of individually packaged prepared food and baked goods, 7 days a week, since they began donating to ExtraFood in February. The staff is always friendly, helpful, and organized, with their donations packaged and waiting for our volunteers when they arrive. Thank you, Grand Avenue Starbucks for your commitment to helping end food waste in our community! An award-winning, family-run business, Woody’s has served the highest quality frozen yogurt, ice cream and milk shakes to customers from all over Marin since 1998. They have the largest selection in Marin County with six frozen yogurt machines and 18 ice cream flavors. Woody’s is the only place in Marin County where you can find Mr. Smith’s Frozen Custard and Sweet 16 super low calorie dessert. The residents at Pilgrim Park Apartments in San Rafael were delighted to receive a special delivery of donated treats from Woody’s earlier this month. We look forward to working more with Woody’s! Peet’s Coffee offers superior quality coffees by sourcing the best quality coffee beans in the world, adhering to strict high-quality and taste standards, and controlling product quality. One of the stops on our famous “Southern Marin Coffee Buzz” food trip, Peet’s generously donates tasty baked goods three times a week to support our friends at the Marin City Senior Center, Performing Stars and the People’s Inter-Cities Fellowship. Consistently rated “Best of Marin,” Comforts Cafe in San Anselmo has been offering fine city and home-style food since 1986. Their menus change regularly to reflect what is fresh and in season, using only the best quality ingredients, and sustainably raised meats and organic produce from local farms. Comforts has been generously donating delicious, highly-sought-after prepared food since ExtraFood began in December 2013. The seniors at Bennett House in Fairfax always look forward to their tasty deliveries every Tuesday and Friday. Mi Pueblo takes pride in creating dishes based on a strict selection of fresh, high quality, traditional Mexican ingredients. And it shows! A regular contributor to our Planned Giving Program, Mi Pueblo creates delicious dishes specifically for ExtraFood to pick up and deliver every week to our recipient partner, SparkPoint of Marin. Our recipients and volunteers can’t say enough about their wonderful food and generosity of heart. Not only does Barton’s Bagels serve up coveted New York style bagels, but they’re community-minded, too. Their recent generous donations of over 50 lbs of extra bagels have fed vulnerable community members from Ponderosa Estates, Voyager Carmel, SparkPoint Marin, and St. Vincent de Paul. We can’t wait to share their delicious extra food with more recipient partners! A women-owned, award-winning green business co-founded by Helen Russell and Brooke McDonnell in 1995, San Rafael, CA-based Equator Coffees & Teas is a specialty coffee roaster, tea purveyor, and coffee farm owner. Since joining the ExtraFood fold last fall, Equator has committed to bi-weekly food donations to support our ever-growing food recovery program. We are truly grateful for their generosity and commitment to serving the hungry in our community. A family-owned, North Indian restaurant in downtown San Rafael, Lotus specializes in using the finest ingredients possible: local, organic and fresh. 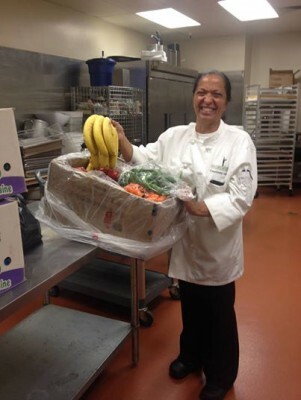 Owners Surinder (Pal) and Linda Sroa provide ExtraFood with delicious food through our Planned Giving program. Every week, for the past 3 years, Lotus has made extra chicken tikka masala, rice, and naan especially for ExtraFood to deliver to vulnerable seniors in San Rafael. We are truly grateful to Lotus for their continued generosity and commitment to helping us end hunger in Marin! Locally owned and operated by the Canepa family since its founding in 1929, Mill Valley Market prides itself on quality, customer service, selection, and community involvement. Their shelves are stocked with unique and interesting products (many of them coming from their customers’ suggestions), as well as everyday grocery staples. Their full-service gourmet deli, catering department, and wine and spirits selections are favorites among locals. We’re delighted and grateful that they’re working with us to get food to those who struggle in our community. A family-owned, community-focused grocery store, Fairfax Market been donating fresh produce, dairy products and packaged food to ExtraFood, three days a week, for three years. To date, they have donated over 24,500 lbs of food! Our friends at the San Geronimo Valley Community Center, Marin Services for Men, and St. Vincent de Paul truly appreciate their generous donations. Committed to providing the highest quality sweets with the best possible ingredients, Sweet Things has been serving Bay Area customers and restaurants from their extensive menu of delicious desserts for 36 years. To the delight of our recipient partners, they’ve recently started providing bi-weekly donations of their popular treats. Yum! Customers first. Believe in being nice. Keep it real. Deliver on quality. Make progress. Philz Coffee follows these simple rules to fulfill its mission to better people’s lives one cup of coffee at a time. If their following of dedicated Philz Coffee lovers is any indication of their success, we’d say mission accomplished. Our recipient partners delight in receiving all sorts of delicious prepared foods and baked goods donations from their tasty menu. The first Trader Joe’s opened its doors in Pasadena, CA in 1967 and quickly became known for its wholesome products, great value, and team dressed in cool Hawaiian shirts. We’re delighted to partner with them to bring generous donations of baked goods, produce, dairy, meat and prepared food every week to support our recipient partners St. Vincent De Paul Society of Marin County and the San Geronimo Presbyterian Church. Woodlands Market has served Marin County since 1985. Founded and owned by grocery entrepreneur Don Santa and still family-owned and run, Woodlands is a key Bay Area destination for a huge variety of exceptional prepared foods, deli and cheeses. We are so thankful for the generous donations of delicious extra prepared food they provide 5 days a week. Their donations have been particularly appreciated this holiday season, providing many much-needed meals for Whistlestop’s Meals on Wheels program. We thank Woodlands for helping to brighten the holidays for many of our county’s most vulnerable people and for their continued support of ExtraFood. An artisan cafe and bakery in San Anselmo, MH Bread and Butter’s goal is to help nourish the community through food. Sourcing ingredients from within the community, providing amazing food that is accessible, real and unpretentious, MH Bread and Butter is a place for people to gather, relax, and enjoy. Our recipient partners look forward to their generous daily donations of tasty breads, muffins and croissants. We’ve been picking up donations of fresh produce, baked goods, dairy products, and prepared food from the Mill Valley Whole Foods on Miller Ave. for nearly four years. To the delight of our recipient partners, they’ve recently added two more regular donations for a total of four weekly donations. We are truly grateful for the bounty of healthy food that comes from Whole Foods. Balboa Café’s modern American bistro menu emphasizes the best of California’s foods and flavors. They’re committed to partnering with local farmers and foragers as well as sourcing sustainable proteins for their meals. Their executive chef’s cooking techniques vary from cutting edge styles to classic favorites with keen attention to local organic produce. Healthy proteins are a hot commodity among our recipient partners and we were so pleased to surprise the People’s Inter-Cities Fellowship this week with a highly valued donation of 100 pounds of turkey breasts for their food pantry thanks to Balboa Café. Founded in 1979, Sweetmill Food Company delivers fine baked goods to locations throughout the Bay Area. From cakes, pies, and cookies to quiche, pirokshi, and bagels, their extensive list of sweet and savory items can meet any baked goods need. We love surprising our recipient partners with their generous donations of tasty treats. Patagonia Provisions offers delicious, healthy food while working to drive positive change in our food system. We recently received a very generous donation of 4 large cases of hundreds of shelf-stable soups, a result of a special offer at Good Earth Natural Foods’ two stores. For each purchase of one of their terrific soups, Patagonia Provisions provided a matching donation to ExtraFood. Our amazing volunteers have been distributing the soups to grateful recipients all across the county. What a treat! Located in the Hamilton Field area of Novato, Beso Bistro serves up a delicious menu of dishes made from local, organic produce, pasture-raised chicken and beef, and sustainably-raised seafood. Demonstrating their commitment to serving their community, the wonderful Beso Bistro staff creates meals especially for ExtraFood each month as part of our Planned Giving Program. The families at Gilead House always look forward to receiving their delicious and healthy donations. A Reform Jewish Congregation in San Rafael, Congregation Rodef Sholom extends their commitment to caring for people beyond their immediate community and into the community at large. We are truly grateful for their continued support of ExtraFood through generous monthly prepared food donations and helping to spread the word about our county-wide food recovery program. The residents and kitchen staff at Homeward Bound of Marin’s New Beginnings Center look forward to their delicious donations each month. A central part of the San Anselmo community, Insalata’s has been creating delicious Mediterranean-inspired food in a beautiful environment for over 20 years. One of ExtraFood’s original “Planned Giving” donors, Insalata’s has been making meals specifically for our food recipients every week since ExtraFood’s inception in 2013. Chef/Owner Heidi Krahling, her husband Mark, and the entire Insalata’s team were tremendous during the Napa/Sonoma wildfire evacuations, generously making free meals for fire evacuees sheltering in Marin. Located in the heart of downtown Larkspur, Donut Alley serves handcrafted artisan donuts and fresh roasted, organic coffee. Under the leadership of Steve and Ann Pring, Donut Alley made their first bakery donation two years ago, and since then has contributed over 4,000 lbs of food. Our friends at Marin Services for Men, People’s Inter-Cities Fellowship, and St. Vincent de Paul always look forward to their deliveries of high quality treats from Donut Alley. A long-time San Francisco institution, Wise Sons recently opened its first brick-and-mortar store outside of the city in the Marin Country Market in Larkspur. We are proud to welcome them as a brand new ExtraFood donor offering Jewish comfort food made from the freshest California ingredients. Their breakfast and lunch sandwiches are especially popular. We thank Wise Sons for the two donations they made their very first week working with ExtraFood. Locally owned and operated, CaterMarin provides creative, delicious Californian cuisine for a variety of events — from weddings and corporate events to lunches individualized for a variety of budgets. 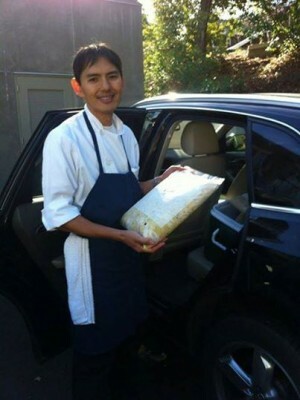 In the past six months CaterMarin has donated 200 lbs of bulk prepared food to the Helen Vine Recovery Center and Homeward Bound of Marin’s Mill Street Center. We are so very appreciative of their delicious contributions! Zero Breast Cancer promotes breast cancer risk reduction through translation of scientific research and evidence-based recommendations that support health and wellness at key stages of life. Our friends at the People’s Inter-Cities Fellowship in Marin City were delighted to receive their gracious donation of over 180 lbs of healthy extra food from their Annual Dipsea Hike fundraiser. We are honored to work with such an important community organization! Most of us are familiar with Whole Foods’ commitment to the highest quality fresh and locally sustained products. Whole Foods’ mission to improve the lives of people in the community may not be as publicized, as but is very clear to us. Whole Foods San Rafael has donated over 43,000 pounds of food to ExtraFood this year. Their delicious produce, bakery items and prepared food have made their way to over eight sites, including Oma Village, SparkPoint Marin Center, Parnow Friendship House, and Schurig Center for Brain Injury. What a fabulous partner Whole Foods San Rafael continues to be! Since joining up with ExtraFood in May of this year, Starbucks, Terra Linda has already donated over 750 lbs of delicious ready-to-eat prepared meals and snacks and pastries. Eager to distribute their extra food to community members in need, they recently increased their donations from two days and week to six! We are truly grateful to all of the wonderful employees at this Starbucks for their dedication to helping make a difference in their community. Panera’s credo is simple and powerful: “Food should taste good. It should feel good. It should do good things for you and the world around you.” We appreciate Panera’s terrific donations, as does our recipient partner for Panera’s donations, Episcopal Senior Communities’ Novato Independent Elders Program at the Margaret Todd Senior Center. Starting as a small food truck business, Johnny Doughnuts has grown into a terrific store you can find on the west end of 4th Street in downtown San Rafael. Tasty, artisan doughnuts are handcrafted with the finest organic cool-milled wheat flour and ingredients from locally-sourced vendors. They offer a huge selection of doughnuts including a fabulous gluten-free one! An industry-leading guide dog school, San Rafael’s Guide Dogs for the Blind prepares highly qualified guide dogs to serve and empower individuals who are blind or have low vision throughout the United States and Canada. All of their services for their clients are provided free of charge. We are so grateful for the donations of extra produce, dairy, and prepared foods they provide whenever they have them. In addition to their regular, thrice-weekly grocery donations of fresh and packaged food, this week we benefitted from an incredible donation of over 6,000 lbs (that’s 3 tons!) of shelf-stable food collected through Safeway Community Markets’ “Bag Summer Hunger” program. Through the month of June, their customers purchased pre-loaded bags of non-perishable foods for $10 each that resulted in the 6,000+ lb donation. Our recipient partners were thrilled to receive this food, which was distributed among many vulnerable children, families, and individuals throughout Marin. Our recipient partners are always delighted to receive Rodriguez Farms’ beautiful and generous donations. Rodriguez Farms’ berries are well-known and coveted among Bay Area residents for good reason. They are sweet and delicious, a testament to the care and commitment to quality of this family-owned farm. 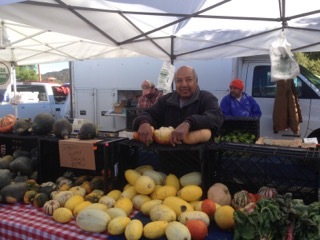 Rodriguez Farms donates to ExtraFood at multiple farmers markets in Marin. Specializing in delicious authentic Thai cuisine, My Thai restaurant is an important member of our Planned Giving program. Each month, they generously make some of their favorite dishes specifically for ExtraFood to pick up and deliver to our recipient partner, the San Rafael Rotary Manor. Safeway San Anselmo‘s baked goods donations have made a HUGE impact on our community. In just 9 months, they have donated nearly 20,000 lbs of food (that’s 10 TONS! )—equivalent to 16,500+ meals—to 20 of our local recipient partners in need. We are truly grateful for their generous donations and commitment to helping reduce food waste and end hunger in Marin. A farm-to-table catering business, A Fork Full of Earth crafts original, seasonally driven menus cultivated entirely from Marin and Sonoma County’s organic and transitional local farms and artisans. This month, in partnership with ExtraFood they initiated a special program offering their clients the option to purchase additional portions of their delicious dishes to donate to ExtraFood. What a wonderful way to give back to our community! Our friends at Mill Street Center were touched and grateful for their and their clients’ generous and delicious donation this weekend. We are so proud to partner with such a bighearted, community-minded business! Committed to inspiring, educating and empowering people to eat healthier and live a better life, Sprouts Farmers Market proudly offers healthy living choices for less. They consistently provide us with incredible produce, prepared, bakery and dairy donations each Sunday which supports the San Geronimo Presbyterian Church’s food pantry. To date, they have donated over 16,800 lbs of food to support the hungry in Marin. We’re delighted to spotlight Marinwood Market in sunny San Rafael as our Food Donor of the Week. In addition to their 6 weekly donations, this friendly neighborhood market surprised us with a wonderful spontaneous donation of over 200 lbs of fresh meat this week. Keeping our recipient partners in mind, the fine folks at the market took time to freeze the meat prior to its expiration date to ensure a fresh donation delivery. Our friends at St. Vincent de Paul were delighted to receive this special protein-packed donation. We thank Marinwood Market for the energy they put into helping us provide some of our community’s most vulnerable citizens with fresh, nutritious food while working to combat food waste. Within weeks of opening, Firehouse Coffees & Teas began donating their extra food to help vulnerable members in our community. Their delicious prepared salads and sandwiches have lit up the faces of the families and kids served by our recipient partners at the People’s Inter-Cities Fellowship in Marin City and LifeSTEPS afterschool program in Tiburon. We love Firehouse for their great coffees, teas, food, and for giving back to those in need! Clairesquares of Sausalito creates handcrafted artisan Irish treats and other premium sweets. This week, Clairesquares donated over 100 lbs of their delicious shortbread cookies to sweeten the lives of those served by four of our recipient partners: Marin City Senior Center, St. Vincent de Paul, People’s Inter-Cities Fellowship, and SparkPoint Marin. We’re delighted that Clairesquares has chosen to send their extra special treats our way! County Line Harvest is a certified organic farm located near the Marin/Sonoma county line. They donate beautiful, fresh produce to our team of volunteers each week at the Sunday Civic Center Farmers Market, as well as whenever they have extras to give. This week, they generously donated over 2 pallets of delicious melons and pumpkins, which we delivered to 5 delighted recipient partners. We are truly grateful for County Line for sharing their bounty with ExtraFood and our recipient partner organizations. Demonstrating its commitment to positively impacting the communities it serves, the 4th Street Starbucks in San Rafael generously donates prepared foods and baked goods 7 days a week to benefit our San Rafael recipient partners Voyager Carmel, Downtown Streets Team, and Family Center. We are so proud to team with Starbucks to help build better communities. Brandeis Marin, an independent Jewish day school, serves K-8 students and their families in San Rafael. Providing students with an innovative, project-based education infused with spiritual exploration and discovery, Brandeis also encourages their students to give back through service learning. Leading by example, the school has generously donated their delicious extra food to us after school events. Thank you, Brandeis for helping to alleviate hunger and waste in Marin! Our Food Donors of the Week, Il Fornaio, Meadowcroft Wines, and Paradise Flowers provided incredible, generous donations for our Volunteer Appreciation Event on May 16th. Our guests raved about about Il Fornaio’s award-winning Italian cuisine; Meadowcroft Wines’ delicious white and red varietals paired beautifully with the food; and Paradise Flowers’ gorgeous floral arrangements helped to create a beautiful, festive atmosphere. These tremendous donors truly made our party a memorable celebration. Taqueria Mi Pueblo in San Anselmo takes pride in creating dishes based on a strict selection of fresh, high quality, traditional Mexican ingredients. And it shows! A regular contributor to our Planned Giving Program, Mi Pueblo creates delicious dishes specifically for ExtraFood to pick up and deliver to our recipient partner, Spark Point of Marin. Our recipients and volunteers can’t say enough about their wonderful food and generosity of heart. Committed to quality over quantity when it comes to farmers markets, The Agricultural Institute of Marin (AIM) currently manages seven Certified Farmers Markets in the Bay Area and represents over 300 family farms, specialty food purveyors, and artisans. AIM farmers and food purveyors have donated well over 100,000 lbs of beautiful produce, baked goods and specialty items from two weekly markets since AIM’s first donation in 2014. We are truly grateful to AIM for their contributions to the cause of ending hunger and food waste in our community. Target is a new member of the ExtraFood family. They joined us in March and have donated over 2,000 pounds of food so far, nearly all of which we’ve delivered to vulnerable people in Marin City. This Target location has truly lived up to the Target belief in being an active corporate citizen and good neighbor. We’re looking forward to a long and fruitful partnership! Patagonia Provisions offers delicious, healthy food and also works to drive positive change in our food system. Last month they ran a special offer at Good Earth Natural Foods’ two stores, providing a matching donation to ExtraFood for each purchase of one of their terrific soups. This week a box with hundreds of soups arrived on our doorstep! It makes our day when we see the smiles on the faces of our partners at such organizations as SparkPoint Marin and Lifehouse Agency as we deliver the food. We are so grateful to Patagonia Provisions for this generous donation. Located at 471 Magnolia Avenue in Larkspur, Donut Alley is a fixture in Marin County. Steve Pring bought Donut Alley in 2008 bringing a family business and tradition from Berkeley. A friendly atmosphere, good donuts, the aroma of fresh brewed organic roasted coffee that “dabbles in the unexpected”, and a sense of pride for the neighborhood is only a part of what makes Donut Alley such a wonderful addition to our ExtraFood family of donors. Their delicious donuts are a favorite of St. Vincent de Paul Society and People’s Inter-Cities Fellowship. One trip to their location and it is easy to understand why their baked-from-scratch delights are such a desired treat. ExtraFood is thrilled to assist in bringing such sweetness to brighten so many lives. Safeway Community Markets in San Anselmo, formerly Andronicos, is a welcome addition to our community of food donors. Safeway consistently provides communities with great food. Few realize how much they support Marin County in making sure that the same quality food we see in the store finds it way to those that need it the most. We deliver their dairy products, deli items, produce and groceries to our partners, who make sure this food finds it way to the homes of families young and old, singles, and seniors. We are so thankful to Safeway Community Markets for supporting our community. Le Comptoir is a French bistro with a modern feel in downtown San Rafael, featuring classic yet casual bistro food. They joined our county-wide food recovery program last week and we’re delighted to welcome them to our program! Costco is a big donor with a big heart! Lafo and his co-workers have already donated more than 4 tons of produce, dairy, packaged goods, and baked goods to ExtraFood, which we’ve delivered to such locations as St. Vincent De Paul Society of Marin County, Pilgrim Park Apartments, Catholic Charities Canal Family Support, and College of Marin. Fairfax Market is a family-owned, community-focused grocery store. They’ve been donating fresh produce, dairy products and packaged food to ExtraFood, three days a week, for just over two years. Our regular volunteer, Hank M, delivers their weekday food donations out to the San Geronimo Valley Community Center and, on the weekends, their food goes to Marin Services for Men. Fairfax Market’s staff are all great to work with and we’re delighted to be partnering with them to serve those in need! Founded in 1979, Sweetmill, a wholesale food distributor, provides a wide variety of sweet and savory gourmet baked goods throughout the Bay Area. This week we’ll pick up 50 boxes of sweet and savory treats including 30 boxes of chicken burritos. What a great donation! Andy’s has two San Rafael locations, Andy’s Sun Valley Market and another store out on Pt. San Pedro Road. They’re a locally-owned company with quality food, great prices, and a commitment to community-based programs and activities. Each Friday we pick up their donations from their Sun Valley store and deliver them to our partners in Marin City. Their donations are abundant with dairy, packaged goods, deli items and more. We love their staff—a pleasure to work with! Trader Joe’s will be celebrating their 50th anniversary this year! The first Trader Joe’s opened its doors in Pasadena, CA in 1967 and quickly began crafting their brand as a wholesome store (with their team dressed in cool Hawaiian shirts), offering great value on all their products. They reached 400 stores 3 years ago and continue to add more each year. We just started picking up from their San Rafael store a couple Sundays ago and their staff has been great to work with! Located in Novato, the program serves over 4,000 students each week. They began their program in August of 2003 and now serve twelve Marin County schools. They also provide senior lunches to 6 community Senior Centers, including our partner San Geronimo Valley Community Center. Their focus has always been on providing healthy, organic and highly nutritious food to our community. Last week, because so many schools had been closed due to the storm, we picked up a terrific donation which we brought immediately to the great people at the Downtown Streets Team in San Rafael. Located at Hamilton Field in Novato, Beso Bistro crafts all of their dishes using local, organic produce, pasture-raised chicken and beef, and sustainably-raised seafood. Because owner Michelle is so committed to giving back to her community, she has chosen to make a special meal every other week for ExtraFood to pick up as part of our Planned Giving program. ExtraFood Volunteer Curt W. delivers the meal to the families at Gilead House. We thank Michelle and Beso Bistro for sharing their fabulous food with vulnerable families in our community! Ponsford’s Place is a wonderful small bakery tucked away in a San Rafael neighborhood. Their philosophy is to bake with no processed white flour and to use seasonally-available ingredients, which leads to an ever-changing menu. The bakery is a bit of a laboratory where the bakers, Craig and Hannah experiment with new varieties of whole-grain artisanal flours. We’re delighted that they share their delicious savory and sweet pastries, as well as bread, with ExtraFood every week! Two years ago this month, The Cheesecake Factory in The Village at Corte Madera began donating their excess food to ExtraFood.org. Their wonderful variety of soups are much sought-after by our recipients, especially the REST Program at St. Stephen’s Episcopal Church in Belvedere and the seniors at San Geronimo Valley Community Center. TCF started out as a mom-and-pop business in Detroit back in in the 1940’s and now operates 175 restaurants around the country. Lotus is a family-owned, North Indian restaurant in downtown San Rafael that specializes in using the finest ingredients possible: local, organic and fresh! Surinder (Pal) Sroa, who owns Lotus with his wife Linda, provides us with wonderful food through our Planned Giving program: every week, his restaurant makes some Chicken Tikka Masala, rice and naan for ExtraFood to deliver to vulnerable seniors in San Rafael. Pal will be opening two new restaurants soon, one on Caledonia St in Sausalito and the other in the Mission District in San Francisco. We thank Lotus for their continued generosity! Kaiser donates their extra food to us 7 days a week, and the bulk of their donations are complete, microwaveable, mostly organic meals — like gold for some of our recipients whose primary need is for proteins or complete meals. Kaiser contributes to the health and wellness of our community in so many ways, and we’re grateful that they’re a longtime member of the ExtraFood community. Marinitas, in San Anselmo, serves tasty, Latin-inspired meals using local and seasonal products in a very lively atmosphere. They have delicious food and a great bar! Marinitas has been donating food from the early days of ExtraFood as part of our Planned Giving program. In that program, we ask restaurants, caterers, and other food-service establishments to make a little extra of something for us to pick up and deliver for those in need. CaterMarin is a locally owned and operated complete catering company combining great food—with an emphasis on local and sustainable—with a stylish presentation. They can proudly handle any event such as corporate events, cocktail parties, weddings, picnics and barbeques and can offer vegetarian, vegan and gluten-free options. They have been donating once monthly since August and their delicious food has been shared with our partners at Helen Vine Recovery Center, San Geronimo Community Presbyterian Church and San Pedro School. The North Face Endurance Challenge is a series of trail running races held nationally and internationally. Last week the Challenge was held in the scenic Marin Headlands. ExtraFood volunteers Ellen M and Tom picked up an enormous amount of snacks, fruit, soda and water, which were delivered to four organizations. Events are always a key source of extra food in our community and we’re grateful to The North Face for donating for the past two years. Every year, Mini of Marin‘s general manager gifts his employees with a turkey for their Thanksgiving feasts. Last week we were delighted to pick up 13 extra turkeys after they had been distributed to the employees. This year some of their employees even gifted their turkeys to ExtraFood! Our volunteer, Diane, picked up the turkeys and delivered all to SparkPoint Marin, in plenty of time for Thanksgiving. What a treat for SparkPoint Marin’s clients! County Line is a certified organic farm located near the Marin/Sonoma county line. We pick up donations of their wonderful produce—they focus primarily on a wide variety of greens and root veggies—every Sunday at the Civic Center Market. And on several occasions, they’ve given us a terrific donation directly from their farm! On Wednesday, two volunteer moms, Diane and Elise, and their daughters drove to the farm to pick up almost 400 pounds of produce and delivered it to 3 grateful recipients. Such generosity from all involved on the very busy day before Thanksgiving! We’ve been picking up donations of fresh produce, baked goods, dairy products, and prepared food from this store for over 2 1/2 years! Each week, all the great food we pick up from this fine store makes its way to many folks in need in Marin City. We are grateful for the bounty of healthy food that comes from Whole Foods! Headquartered in San Rafael, Byte serves up healthy, hearty, grab-and-go-type meals. They offer Bay Area businesses around-the-clock food options by stocking their refrigerated kiosks with healthy food. It’s as easy as swiping a credit card and selecting your food option! Seniors, the homeless, youth organizations, Canal residents, and many more have benefited from our regular deliveries of Byte’s delicious food. The Whole Foods store in San Rafael is always very generous with their donations of excess food to our county-wide food recovery program. We pick up all types of food from this store…dairy, baked goods, frozen food, produce and packaged goods. Their donations provide food for people from Marin City to West Marin to Novato! And their team members are always helpful and great to work with. Bioneers is a nonprofit organization based in New Mexico and California that promotes practical and innovative solutions to global environmental and bio-cultural challenges. The Annual National Bioneers Conference, which is held this week at the Marin Civic Center, connects thousands of people with practical, visionary solutions for humanity’s most pressing environmental and social challenges. We are delighted to pick up their extra food from their two event dinners at Embassy Suites this weekend. Zero Breast Cancer helps individuals and communities understand scientific research on environmental risk factors and lifestyle variables that influence breast cancers. They focus on factors that an individual can change to prevent breast cancer initially, as well as recurrences: stress management, physical activity, nutrition and health, and breast feeding to mention a few. Last week our volunteer Mary W picked up almost 400 lbs of excess healthy food from their Annual Dipsea Hike! The College of Marin donates food from their cafeteria on Friday afternoons—pastries, salads, and other packaged food which is gratefully received by the senior residents at Bennett House in Fairfax. They’ve been a wonderfully consistent donor since April 2015! Great Performances is a New York City-based caterer that does a big event out at McNear’s Beach in San Rafael every year at this time. They do a lot for any community they serve, including making food recovery a core value! We’re delighted they call on us every year to get their fabulous excess food to those in need. Sprouts’ new San Rafael store joins over 200 Sprouts Farmers Markets in 12 states across the country, all with fresh, natural and organic food at great prices. Their motto: “It’s healthy living for less.” Last week Sprouts donated 500 pounds of chicken, the largest amount of protein that we have ever received! Arizmendi ​offers a wide selection of delicious fresh-baked goods and pizzas. And their San Rafael store is part of the Association of Arizmendi Cooperatives, which are all independently owned and operated by their workers. We now pick up their terrific donations 6 days a week and we’re grateful for their generosity! Located in Greenbrae’s Bon Air Shopping Center, SusieCakes has been a regular donor since March 2014. They’re an all-American bakery offering classic desserts made entirely from scratch, using simple, natural ingredients. Many of our recipients have enjoyed their delicious treats, especially the YWCA, who serves them at their monthly graduation programs and Ambassadors Of Hope And Opportunity who serves them at their youth team planning meetings. We began picking up from Marinwood last week—6 days a week! All reports are that they are easy to work with and have kind staff members who are willing to help and answer questions. Deli items and produce are available each day with dairy, bread and occasionally meat and poultry offered on other days. Our recipients have all been so happy with the food quality from this market. Many thanks to Marinwood Market for helping us serve those in need in our community! The Marin Community Clinics provide a wide range of primary care and wellness services for adults and children, particularly low-income community members—including the uninsured. The Wednesday afternoon San Rafael Clinic HealthHub provides a variety of services for hundreds of clients, including a food pantry, disease screening, medical referrals, nutrition education, and physical activities. We’re proud to support Marin Community Clinics’ vital work in our community! Marin Cyclists is a nonprofit club dedicated to helping cyclists meet up to experience the wonders of riding in Marin County and the wider Bay Area. Their signature event is the annual Marin Century (six rides ranging from 30 to 200 miles) held August 6. We were delighted to pick up the extra food from the event and get it to those in need! Based in Fairfax, this farm-to-table organic catering business crafts original menus that are driven by what’s in season, and cultivated entirely from Marin and Sonoma County’s organic, local farms and artisans. They cater big events and smaller events such as birthday parties or picnics. Check out their website for sample menus! Sugar is a one-of-a-kind candy boutique in downtown San Anselmo. Their candy includes seasonal confections, nostalgic favorites and artisan treats. Plus they have a great selection of cards and gifts for a one stop shop for presents! We picked up our first donation from them this week and it was happily received by the students at Next Generation Scholars. In addition, the two high-school-age daughters of Sugar’s owner want to be ExtraFood volunteers! Located on the west end of 4th St in downtown San Rafael, Johnny Doughnuts’ tasty, artisan doughnuts are handcrafted with the finest organic cool-milled wheat flour and ingredients from locally-sourced vendors. They offer a huge selection of doughnuts including a killer gluten-free one! Located in San Anselmo, Flour Craft is Marin County’s first entirely gluten-free bakery. They offer bread, pastries, cakes, granola, and savory lunch & breakfast items. We’ve been picking up their generous donations since December 2013, during the first days of our organization. We can say from personal experience that even if you’re not gluten-free you may still love their goodies! Located in downtown Fairfax, Taste is an eat-in or take-out full-service bakery & cafe. Their terrific food is made from organic, seasonal, fresh-from-the-farm ingredients. Rochelle and Lorenzo, the owners, have been donating their delicious savory and sweet pastries and salads to us whenever they have extras. The seniors at nearby Bennett House look forward to these tasty treats! Last week CVNL hosted the annual Bay Area Human Race, an amazing community event where over 40 teams fundraised for local nonprofits, schools and community groups. Being thoughtful about food waste, CVNL alerted us in advance that there would be extra food from the race day. Kudos to CVNL for “thinking green” and helping us get great food to people in need! Andy’s has two San Rafael locations, one in the Sun Valley neighborhood and the other out on Pt. San Pedro Road. It’s a locally-owned market with quality food, great prices, and a commitment to community-based programs and activities. Their donations to ExtraFood have included generous quantities of dairy products—much-prized by our recipients. We look forward to working more with Andy’s! The winner of two OpenTable Diners’ Choice Awards, Los Moles San Rafael focuses on bringing the distinct flavors from traditional Mexican pueblos and showcasing them with a modern twist. Founder and Chef Lito uses family recipes with no gluten, lard, refined sugar or other artificial ingredients and uses only fresh local ingredients. We’ve eaten at the restaurant and can personally attest that their chicken mole is delicious! We’re delighted to bring Los Moles’ weekly donations to the students at Next Generation Scholars. Located at Hamilton Field in Novato, Beso Bistro crafts all of their dishes using local, organic produce, pasture-raised chicken and beef, and sustainably-raised seafood. Because owner Michelle is so committed to giving back to her community, she has chosen to make a special meal every other week for ExtraFood to pick up as part of our Planned Giving program. ExtraFood Volunteer Curt delivers the meal to the families at Gilead House. We thank owner Michelle and Beso Bistro for sharing their fantastic cooking with vulnerable families in our community! Lotus is a family-owned, North Indian restaurant that specializes in using the finest ingredients possible: local, organic and fresh! Surinder (Pal) Sroa, who owns Lotus with his wife Linda, is generous, warm, and welcoming, and has always lived by the principle of giving back to his community. Pal provides us with food through our Planned Giving program: every other week, his restaurant makes some Chicken Tikka Masala, rice and naan for ExtraFood to deliver to the seniors at San Rafael Rotary Manor. We’re delighted that San Rafael City Schools is the second public school district in Marin to join our program. And they’ve given us some wonderful donations recently, including 15 gallons of Straus organic milk! Since it’s impossible to forecast with 100% accuracy exactly how many kids will be at school and exactly how much they will eat and drink, schools will often have extra food, and we’re glad to partner with them to get it to those in need. Kudos to SRCS for their focus on reducing food waste! Our Food Donor of the Week is Caleruega Dining Hall and Chilly’s Cafe at Dominican University of California in San Rafael. Dominican’s food service is managed by long-time ExtraFood partner Epicurean Group, specializing in corporate and campus restaurants, catering services, and more. We’re grateful to Dominican and Epicurean Group for joining with us to help end hunger in Marin! If you’re looking to be in harmony with the water, soil and air and want a taste of the honest meditative work that coaxes everything from artichokes to winter squash out of the ground, look no further than Green Gulch Farm at Muir Beach. Situated in this heavenly valley, Green Gulch is a Zen center, organic farm, teaching facility for meditation and organic farming techniques and home to many curious travelers and eager volunteers. A generous donor to ExtraFood from their farm as well as their stand at the Mill Valley Farmers’ Market, Green Gulch’s gardens are now seeded with cover crops, which will eventually be plowed under to renew the soil. In this season of renewal, we bow in thanks and offer gratitude for the bounty given to us, to give to others…a double blessing. High Tech Burrito was established in 1986 in a small space in San Rafael but since then has spread to 15 different locations throughout the Bay Area, including 4 in Marin. Their food is fast, fresh, and made with lots of customizing options. Besides their delicious food, High Tech believes in making a difference in the communities they serve—offering fundraising opportunities for schools, sport clubs, and PTA groups among others. High Tech also supplies burritos to schools for school lunch programs. Last month ExtraFood partnered with High Tech on a holiday promotion, in which their customers donated free menu items received through HTB’s loyalty program, HTB matched every donation, and ExtraFood picked up and delivered the items to those in need. Starting this month, High Tech will make and donate fresh food twice monthly through our Planned Giving program. What a great partner! Ponsford’s Place is a wonderful small bakery tucked away in a San Rafael neighborhood. Their philosophy is to bake with no processed white flour and to use seasonally-available ingredients, which leads to an ever-changing menu. The bakery is a bit of a laboratory where the bakers, Craig and Elizabeth, experiment with new varieties of whole-grain artisanal flours. We’re delighted that Ponsford’s is a regular donor to ExtraFood! Check out their website for some of the innovative products they’re developing. Say Hay Farms is a new vendor at the Thursday Marin Civic Center farmers’ market. This season they’re selling specialty root vegetables, broccoli, cauliflower and leafy greens as well as their lovingly-made and packaged pickled carrots, beets and raw sauerkraut. Chris Hay (yes, his real name) and his team run an “integrated operation” at Say Hay Farms, which means that animals and vegetables rotate in the fields, each benefitting from the prior use of the other in a carefully stewarded true circle of sustainability. Say Hay to them at the Thursday market and consider joining their CSA. Our Food Donor of the Week is the North Face. The North Face Endurance Challenge is a series of trail running races held nationally and internationally. Last week the Challenge was held in the scenic Marin Headlands. Sharing the donation with Sonoma County Food Runners, ExtraFood picked up an enormous amount of snacks, fruit and water, which we delivered to five organizations. Events are always a key source of extra food in our community and we’re grateful to The North Face for joining our program! Owner Saleem’s vision for Banzo Cuisine is to improve cultural eating habits by providing clean proteins, high fiber and low saturated fat foods to lower heart disease and promote overall healthy living. Marin Interfaith Council (MIC) is a collaborative that celebrates faith traditions, advocates justice and builds community. MIC cultivates a community diverse in belief, opinion, and culture. For over thirty years, MIC has enabled congregations, nonprofits and individuals to make Marin a more vibrant and equitable community. Last week MIC generously shared their extra food with us from their annual “Visionary Marin” event. San Pedro School’s Family Program was delighted to be the beneficiary of all those tasty desserts and savory treats! Located in the Hamilton Field area of Novato, Beso Bistro and Wine Bar crafts all of their dishes using local, organic produce, pasture-raised chicken and beef, and sustainably-raised seafood. Because owner Michelle is so committed to giving back to her community, she has chosen to make a special meal every other week for ExtraFood as part of our Planned Giving program. The donation is delivered by our volunteer Curt to the families at Gilead House who always look forward to Michelle’s delicious and healthy food. Located in Greenbrae’s Bon Air Shopping Center, SusieCakes has been a regular donor since March 2014. They’re an all-American bakery offering classic desserts made entirely from scratch, using simple, natural ingredients. Stop by Bon Air and check ‘em out! Our recipients love their treats. Sunnyland is perfectly named as Eddie’s sunny smile is the first thing you’ll see when you pass the information booth at the Civic Center farmers’ market on Thursdays and Sundays. Eddie and his wife Maria started out growing yams and root crops but when they moved to Ripon in the San Joaquin Valley, the richer soil allowed them to branch out, literally, planting fruit trees in the hospitable earth there. Now they’re known for their long seasons of delicious stone fruits and, at this time of year, for their abundant varieties of apples and sweet pomegranates. We’re so grateful for their consistent donations to ExtraFood! Bioneers is a nonprofit organization based in New Mexico and California that promotes practical and innovative solutions to global environmental and bio-cultural challenges. The Annual National Bioneers Conference was held at the Marin Civic Center this past weekend and connects thousands of people with practical, visionary solutions for humanity’s most pressing environmental and social challenges. We were delighted to pick up their extra food from their two event dinners at Embassy Suites in collaboration with FoodShift and to be in partnership with such innovative people! Fiddler’s Green Farm of Brooks, California is one of the oldest organic farms, earning certification in 1982. Jim Eldon bought the farm in 1991 and has kept it intentionally small, employing just 4 people year-round and growing delicious roots and greens with his wife, Julie Rose. While we wait for Spring and FGF’s terrific asparagus, go deep to the roots this season and enjoy their artful black or watermelon radishes from the Thursday or Sunday Civic Center Farmers’ Markets. Balakian Farms of Reedley, CA is run by 3 generations of the Balakian family—Amber Balakian, her father Clarence, and grandmother Stella, and was started by Amber’s grandfather John, the son of an Armenian immigrant who was born and raised on the property. Reedley has an ideal climate for the many varieties of tomatoes and delicious stone fruits they grow. 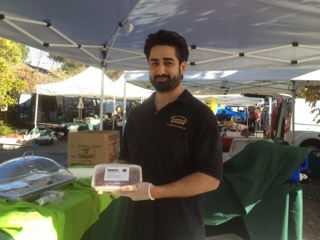 Balakian is Certified Organic, and has been incredibly generous to ExtraFood at the the Thursday and Sunday Civic Center Markets as well as the Friday Farmers’ Market in Mill Valley. We’re grateful for the generous donations of heirloom tomatoes, peaches, plums, pluots, and nectarines. Located in the Central Valley town of Winton, Kashiwase Farms has been certified organic since 1997. The current owners, Stephen and Lisa Kashiwase, have deep family ties to their land. Stephen’s father was a Japanese immigrant who purchased his first acreage in the early 1920’s. They are best known for their stone fruits— such as plums, peaches, and nectarines — and Asian pears and almonds. ExtraFood, and the many we serve, are so grateful for Kashiwase’s generous fruit donations at the Thursday and Sunday Civic Center Farmers Markets​. Marin General has been donating food since the early days of ExtraFood, and Mike and his team make sure that the food we receive, which is made in the hospital’s own kitchen, is of the highest quality. Seven days a week, week in and week out, the food is consistently picked up by our volunteers and delivered to several recipients who all value the quality of the meals we bring to them. And this week, Mike donated hundreds of emergency food kits that will help the homeless and other vulnerable people in our community. Marin General is a huge contributor to community life and we are delighted to be working together to help feed the hungry in Marin. Chipotle serves great Mexican fare using the freshest ingredients with an emphasis on “food with integrity”. In other words, as often as possible, they use food with respect to the animals, the farmers and the environment. We are so pleased and grateful to be delivering their extra food three times a week and our recipients are very happy with Chipotle’s terrific donations. Swing by the Montecito Shopping Center in San Rafael and try some of their terrific food! Ponsford’s Place is a small bakery tucked away in a San Rafael neighborhood. Their philosophy is to bake with no processed white flour and to use seasonally available ingredients, which leads to an ever-changing menu. The bakery is a bit of a laboratory where the bakers, Craig and Elizabeth, experiment with new varieties of whole-grain artisanal flours. Soon, the owners will be offering classes in their shop. Check out their website http://www.ponsfordsplace.com/Ponsfords_Place/Ponsfords_Place.html and read a recent NY Times article that was written about them. If you walk in one time, you’ll return for sure. The aroma there is delightful! Congregation Rodef Sholom continues to be extraordinary in their support of ExtraFood. They give us a regular, large monthly food donation, regularly contact us to pick up additional donations, publicize our volunteer opportunities in their weekly email to their congregants and their print newsletter, and frequently talk about our program with anyone who will listen. The faith-based community is very important to our work in so many ways, and Congregation Rodef Sholom is an exemplary partner in that community. team is great to work with, very attentive to reducing waste, and committed to supporting a variety of programs in our community. We’re grateful for our partnership with Whole Foods! Chipotle Novato made their first donation this week—a dozen freshly-made burritos—and they plan to continue donating. They’re part of our Planned Giving program—organizations that are taking a little extra time and ingredients to *make* extra food for us to deliver to organizations feeding the hungry. Theirs is the kind of donation that fits so well for so many of our recipients. And Chipotle’s food is great! Check ‘em out! The Marin Interfaith Council cultivates community discussion of values and appreciation of different beliefs through educational and experiential programs for the greater public, and for religious leaders. MIC also increases the impact of nonprofits by connecting us with faith communities, which for us are important sources of volunteers, publicity, and food donations. MIC is a great resource in our community, and we thank for donating the extra food from their event this week. Comforts Cafe in San Anselmo has been with us since our program began. Any of you who’ve been there know that they serve a terrific breakfast and lunch, as well as having one of the best take-out counters in the county. They donate great food that works so well for a variety of our recipients. Please check ‘em out, tell a friend, and show ‘em some love! This week, the Bay Area Discovery Museum in Sausalito gave a 330-pound donation of uncooked hot dogs, buns, and milks that worked perfectly for one of our recipients. Besides providing the museum itself, which is magical, the BADM has a variety of classes, events, and programs for kids of all ages, and for parents too! Check ‘em out. Thanks to our volunteer Lynne who led the way in collaborating with our friends at Food Shift, and thanks to Scott the terrific chef at Embassy Suites, we’re picking up lots of extra food from 2 conference dinners this weekend. Bioneers is an amazing organization that is committed to sustainable practices, and we thank them for their focus on reducing their food waste and helping to feed the hungry in our community. Andronico’s Community Markets in San Anselmo has been increasing their donations of late, most often packaged sandwiches. These are perfect donations—what we call “takeaway” food—for our partners who serve the homeless. Those partners are often preparing bag lunches and other ways that the homeless can easily pick up food to eat immediately or carry food with them. And of course sandwiches work well just about everywhere! Arizmendi San Rafael Bakery & Pizzeria donates on Thursdays and Fridays, and any of you who’ve done it know that it’s terrific stuff—great baked goods, yes, but they recently started donating take-‘n’-bake pizzas, too, and a lot of them. Check ‘em out on 4th street in downtown San Rafael, you won’t regret it! The Mill Valley Farmers’ Market is part of Marin Community Farmers Market Association (MCFMA) . This year-round market is tucked next to the CVS parking lot on E. Blithedale on Fridays from 9-2:30, packed full of delicious seasonal fruits and vegetables (including organics) gorgeous breads and baked goods, small batch granola and wonderful people. Each week, through the generosity of the farmers there, we glean 6-8 boxes full of seasonal produce and bread. Las Camelias in San Rafael is part of our Planned Giving program: they’re making extra food for us to pick up - and great food it is! Check ‘em out! The Fairfax Community Farmer’s Market is one of Agricultural Community Events’ markets. It’s a friendly market, easy to navigate in a short space of time, and the amount their generous vendors have been donating is a perfect fit for our recipient. Check ‘em out on Wednesdays! 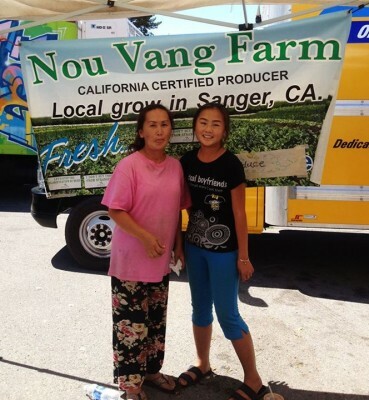 Nou-Vang is a regular donor at the Sunday Civic Center market, and for the last 2 Sundays they have donated 10+ boxes of gorgeous tomatoes, squash, and eggplant. Yowza! For those of you who shop at the market, please go by and show them some love. Lynn is a true pioneer and leader, having developed and/or managed 20 farmer’s markets over the past 30 years, including the original Marin County Farmers Market in 1984. She’s had a huge impact on the availability of fresh, local food in Marin. And, she has worked in myriad ways to help educate Marin residents about sustainable agriculture. ExtraFood.org picks up donations from 3 of GGFMA’s markets—Tam Valley, Corte Madera, and Mill Valley—and we’re grateful for GGFMA’s help in establishing and expanding the flow of donations from their vendors. Whole Foods San Rafael has been donating large amounts of extra food — produce on Sundays and produce, dairy, prepared food, and bakery goods on Mondays and Tuesdays. Andrea in Community Relations, Steve and Edna in Dairy, Fred and team in Produce — they’re all terrific, and making a huge difference for hungry people in Marin. Andronico’s has been with us since our second week, donating sandwiches and salads twice a week. And now they’ll be expanding what they’re donating. Jonathan, Christine, and all the staff there are great to work with and they do a lot for our community. Thank you Andronico’s! Branson was our very first donor, and they’ve been donating terrific food three times per week. And a lot of it! Thank you Chef Akira and Branson. At Mi Pueblo in San Anselmo, the delightful Mimi makes and refrigerates 20 burritos for our recipients each week. Yes, *makes*. It’s what we call “planned giving”: as long as an organization is already making food, if they make a little extra (or a lot) we’ll pick it up. Thank you Mimi! Please show Mi Pueblo some love….